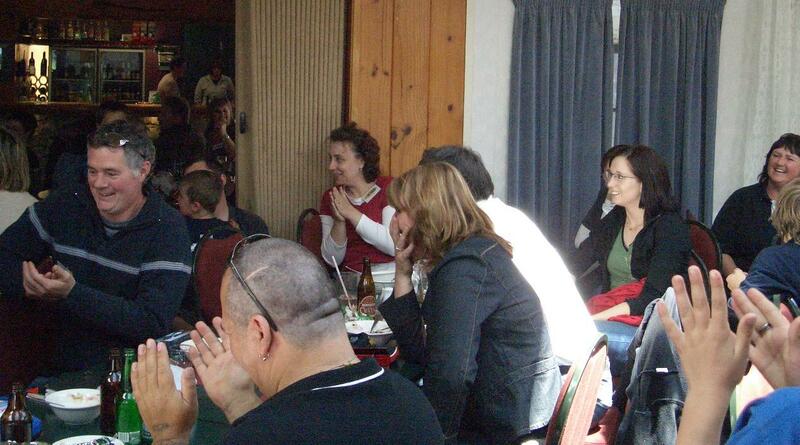 This page provides brief descriptions and photos from 2006 club events. 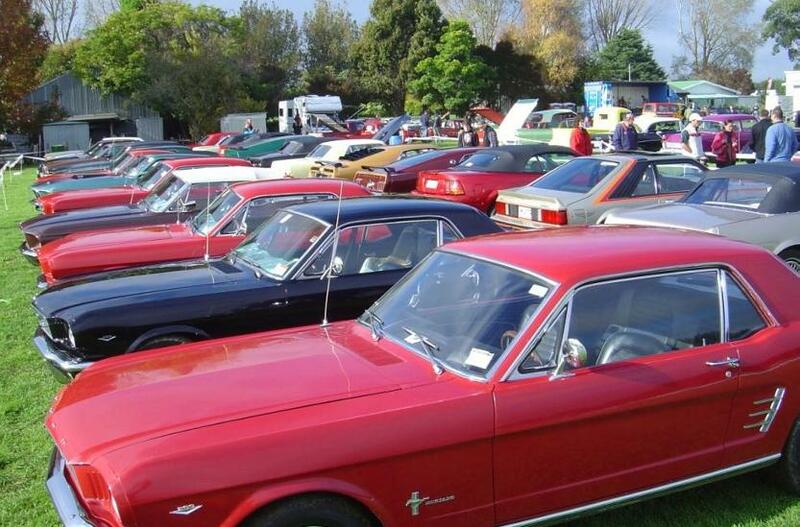 Yes, another fantastic sunny day in the Levin area, just what a bunch of Mustang owners dream of when they wake up in the morning and look at the window. 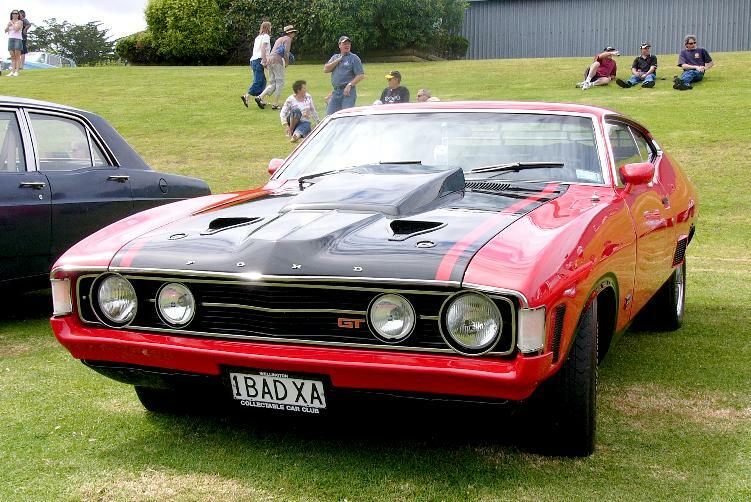 Another Xmas just around the corner and what better time to get together again to look at fine vehicles and a last catch up with friends before the holidays. The venue, Tatum Park had plenty of parking for us all which is good due to the number of cars that rolled up the drive. All parked up, we milled around checking out what’s new and old of course before it was time for lunch and possibly a sit on Santa’s lap for those that had been all sugary and nice through the year, which of course should be all of us. Lunch was served and shortly after Santa appeared in his jolly red suit and all boys and girls, about 80 of us big and small lined up for a present from the jolly fella. Well done Santa. After another fine outing with fine folks and fine automobiles we all headed off in our different directions until the beginning of 2007. 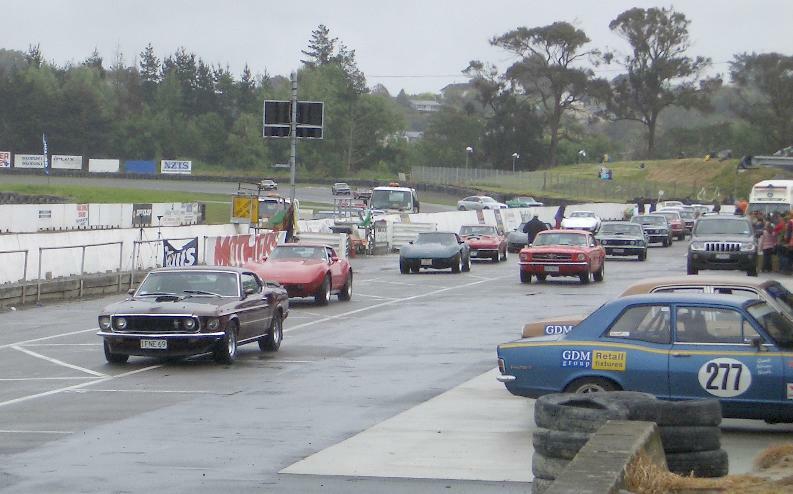 Another weekend of racing on the calendar at Manfeild, this time it was the Whittaker’s MG Classic Motor Race Meeting held over both the Saturday and Sunday. 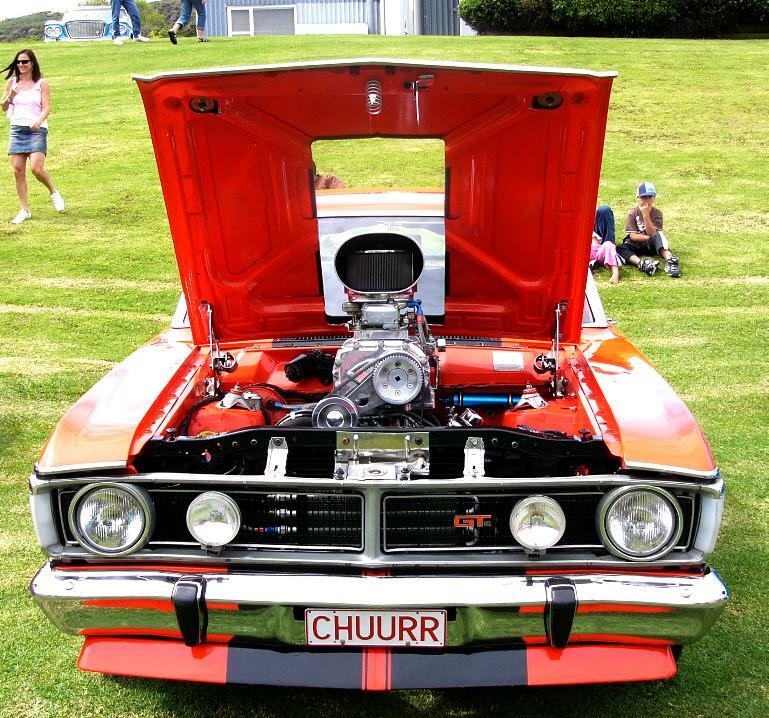 A number of club members went on Saturday and got to see some good racing as the day was fine and the track was dry unlike Sunday, and just our luck we were displaying our fine and clean vehicles and doing the lunch time charity rides on the Sunday. Well what fun that turned out to be (not), the rain came and didn’t really stop. A few of us got stuck on arrival in our allocated parking spot and therefore didn’t stay clean for long. Once we were all sorted and secure on reasonably hard ground we found the driest place possible to watch a bit of racing before lunch and it was our turn to get out on the track and do some laps. All bar a couple lined up on the dummy grid to do the Charity rides, tops even went down despite the weather. Unfortunately due to the rather wet track the speed was kept down to avoid any incidents happening out there but I don’t think the reduced speed took away any of the fun they had, drivers and passengers alike. 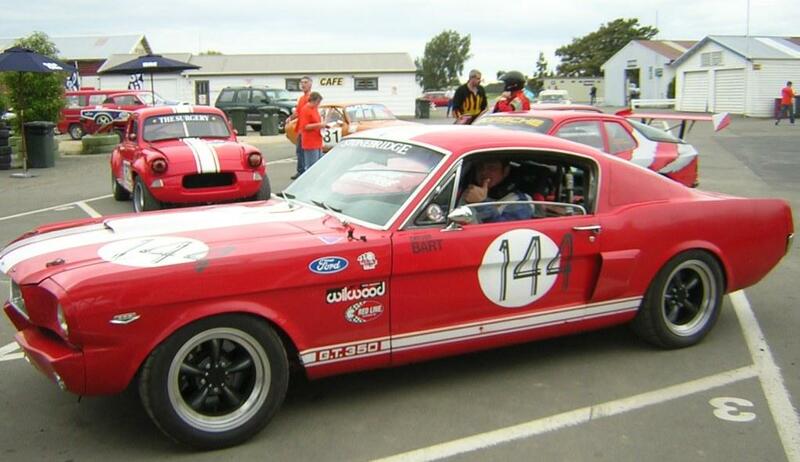 Video- Cars passing out for charity laps. (5MB) . 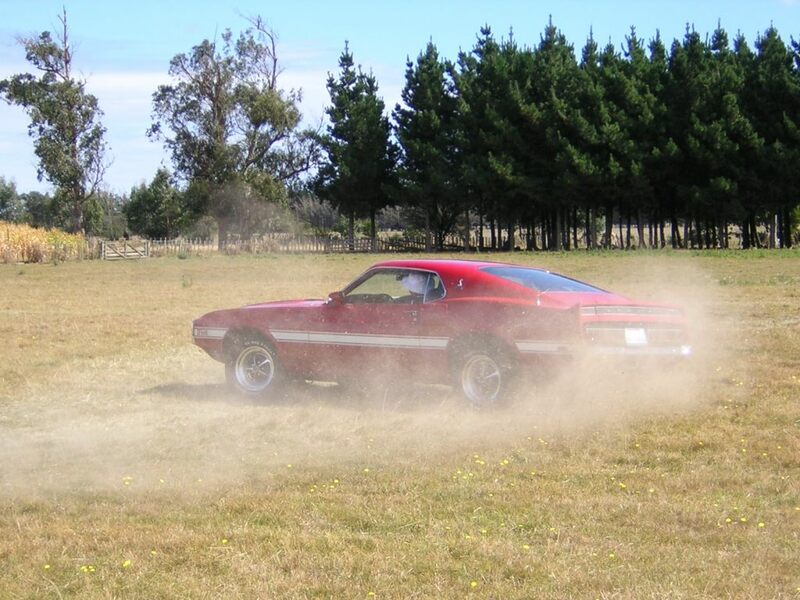 Spring was in the air, the sun was shining, birds chirping and Mustangs a humming. 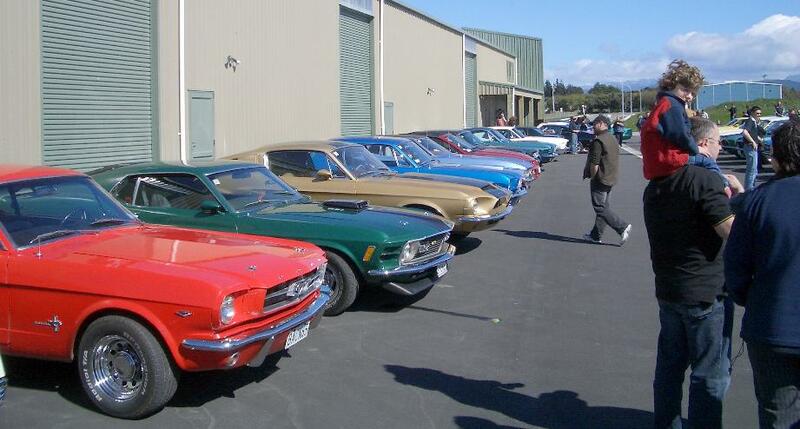 About 40 fine specimens made their way to Magoo's new premises in Masterton. 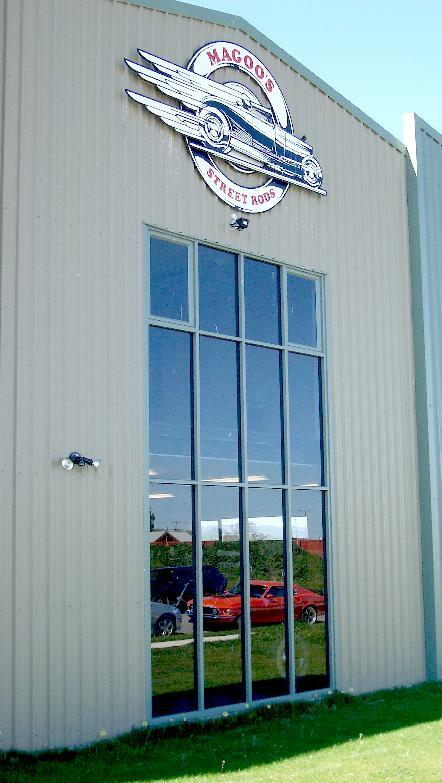 Once all parked-up and caught-up, we were invited in for a tour of the workshop which held some very fine creations. Not to forget the shop with all its shiny bits-n-piece's just made for Mustang owners that love to buy little presents for their Stangs. Big thanks to Magoos. After a couple of hours milling around at Magoos, we headed off up the road to Burridges Café to sit in the sun for lunch. Great afternoon had by all I think. A mixed bag of weather for the morning in the lower North Island but we pulled our nice clean cars out of the garage and set off to the Woodlands Lodge/Café near Sanson for lunch. With the rain and pollen in the area most didn’t stay clean for long, lucky it wasn’t a show’n’shine day! 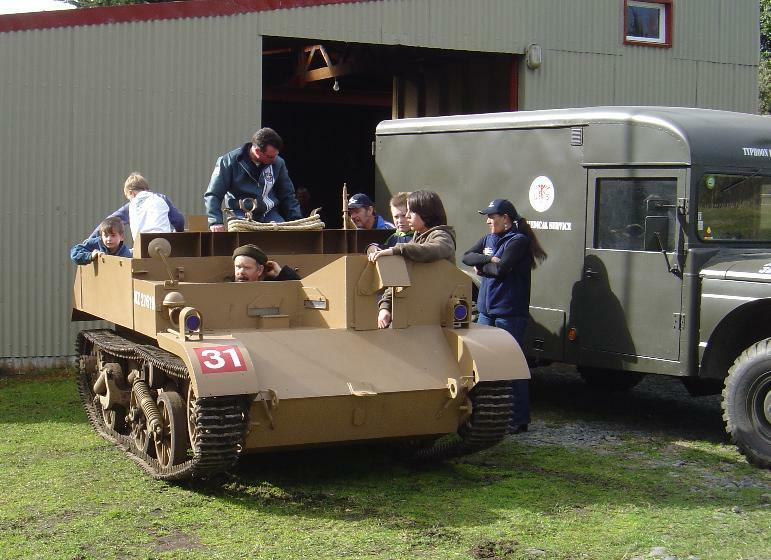 After lunch and a catch up a few went off to Bruce Berkhan’s to see his military vehicle collection. If it was fine enough he was going to get a few vehicles on the move and do rides and that he did to the delight of young and old. Well Dannevirke displayed some fine weather for us as we moved in on the quiet little town, about 28 Mustangs coming from all directions, North, South, East and West we rumbled in and parked up across the road from the Barrel House Restaurant/Café that kindly opened its doors to us for lunch and a very nice lunch it was. A great place to stop for a bite if you’re local or just passing through as we do occasionally! Then afterwards some wondered down to the Fantasy Cave to view the wonderful displays of old and new nursery rhymes and such whilst others went to Dave’s Dean to have a look see at the model collection. 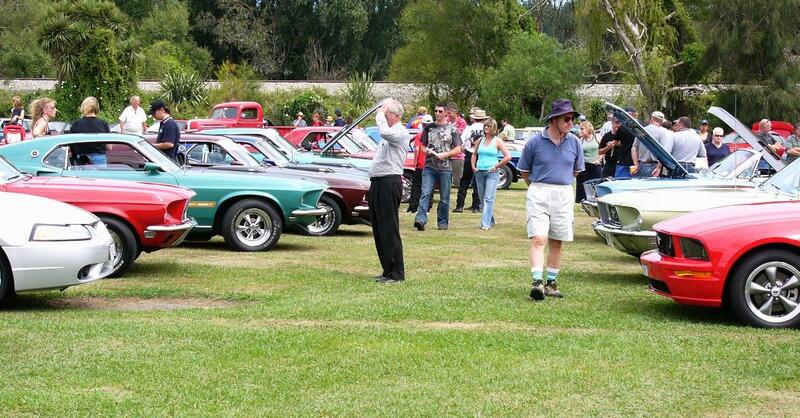 Quite a number of us made our way to Palmy for the AGM and Show ‘n’ Shine. 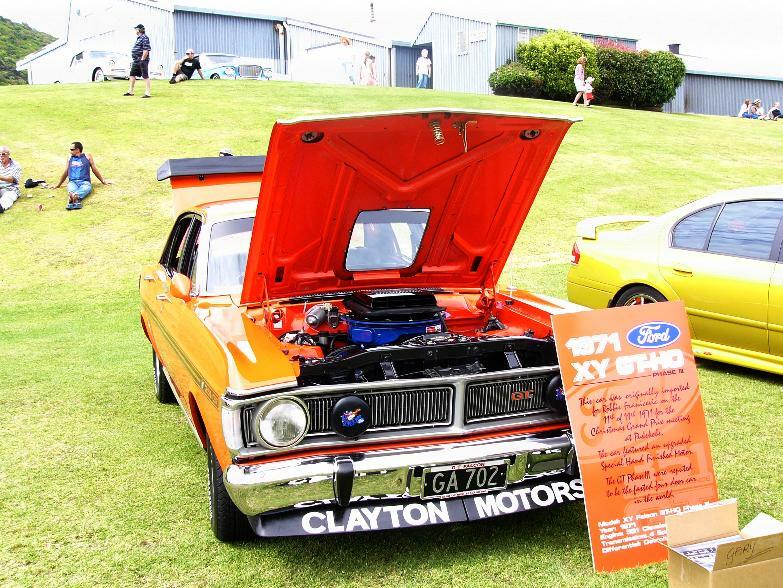 The weather held up for us and the show ‘n’ shine was possible, but only a handful opened up for the trophy and the winner was clear, having not long come out of the assembly garage. 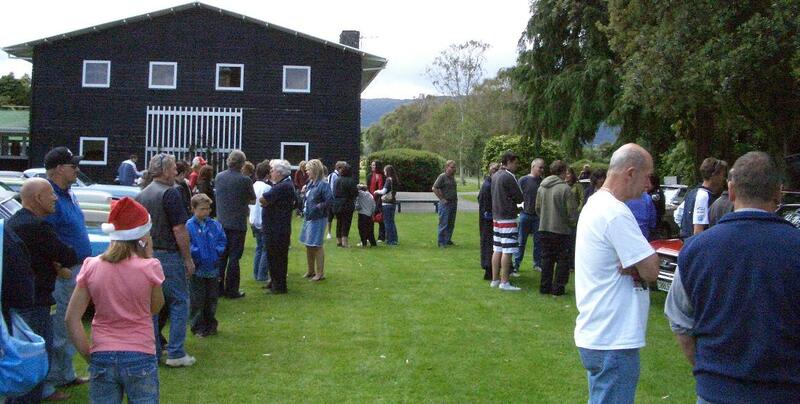 A few more trophies were handed out to individuals and a good afternoon had in good company. We also finally got the triplets together for a photo shoot. 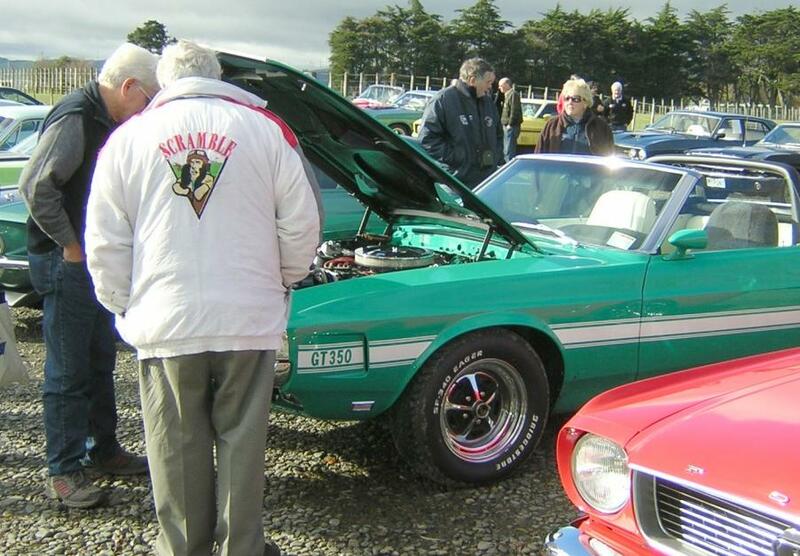 A special thanks to the Vintage Car Club for the use of their clubrooms again, doesn’t get any better on a cold day than standing in front of that wonderful fireplace. 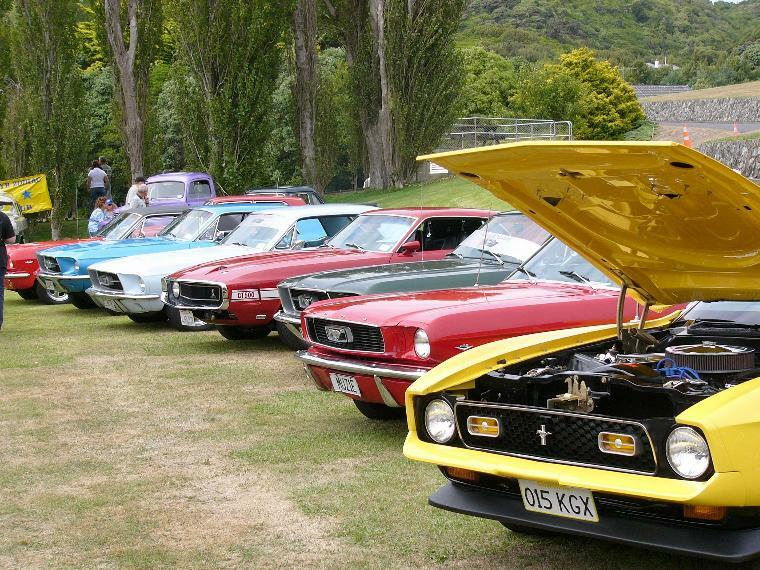 A few of us travelled up/over to the Hawkes Bay for a weekend catch up with our members from the area and attend the Meeaneee Swap Meet & Car Show. The weather gods provided a mixed bag for the weekend and forced a bit of car cleaning in the hotel car park on Saturday afternoon (a good bonding exercise with all hands in). Earlier Saturday we all met up at Brookfields Winery for a spot of lunch and general meeting, then later for dinner in Havelock North. Sunday morning in the drizzle we displayed at the Meeanee event for the day. Another great turnout of Mustangs from the club and as a result, the club and a couple of individuals took away some prizes from the day. We parked up in the Esplanade Garden grounds and enjoyed a catch up over lunch at the Esplanade Café. 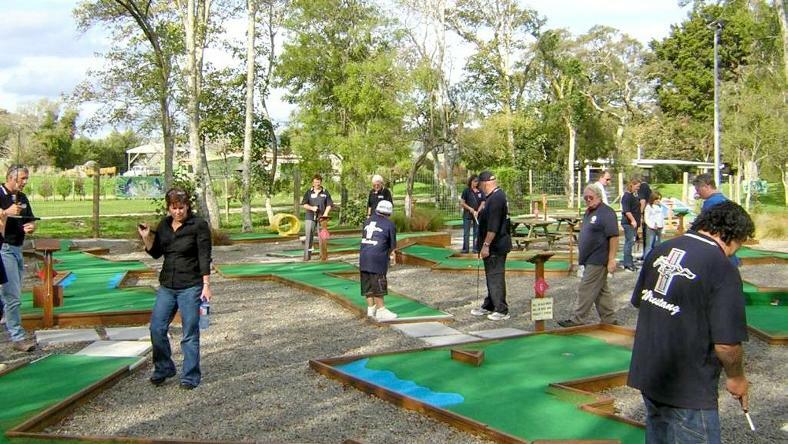 After lunch and a meeting some wandered the grounds, through rose gardens and aviaries, while others made their way for a round of Mini Golf at Brookfields Golf Course off Napier Road. 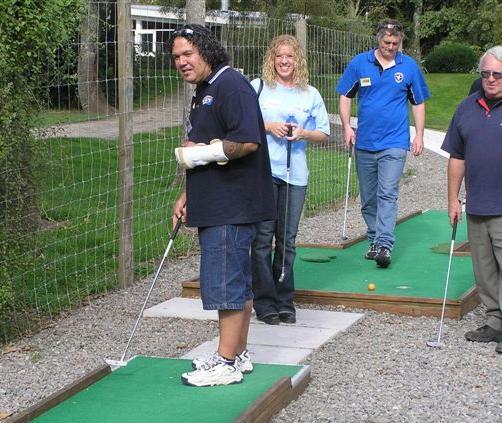 Even the one-handed managed to make it through the round; scoring wasn’t good but we enjoyed it anyway. The MG Car Club kindly invited us to display our fine vehicles at their Charity Classic Race meeting at Manfeild. A good number attended the day’s event and participated in the lunch time Charity Rides around the track. We might not have got to race each other but definitely got a lot of enjoyment in driving the extended track and experiencing the excitement from the little - and big - passengers who came for the ride. Our very own racer Craig Bartosh was in fine form of course for the day and won at least one race that I saw. The weekend began with a dinner at the Bridge Motel restaurant. 28 club members sat and wined and dined, waiting for the sun to go down and our allocated slot at the Corn Evil Maze to begin. 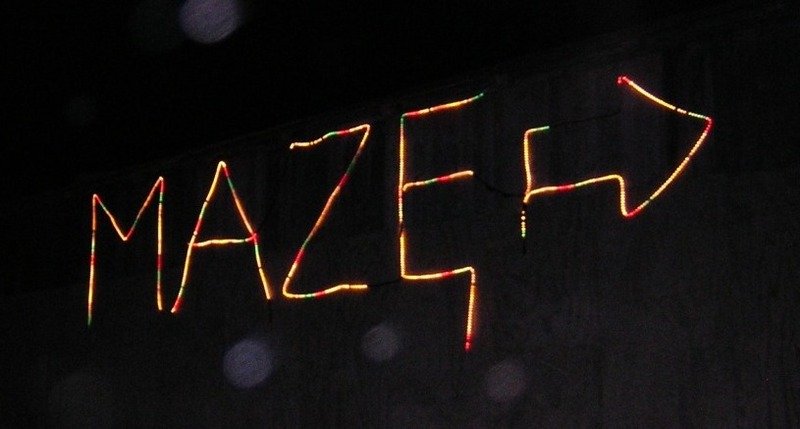 So around 9 pm we supped the last drops and crammed the last desert and headed out to the Maze. And.. much to our surprise, it was really crowded! It was a fascinating experience...and certainly very much more scary for some than others. Just as we entered it was "interesting" that the moon previously bright and clear in a starry night sky, suddenly clouded over and went blood red.....Walking through with the maze way over head high and having paid maniacs in Halloween costumes, race out at you in the dark with knives, axes and chainsaws, was certainly an experience to remember! Sunday turned into another great day out playing in the sun. We arrived at the Maze‘n’Maize about 11am, parked up and took the time to wonder through the Corn Maze, some of us taking more time than others and some needing the help of a map to get out. 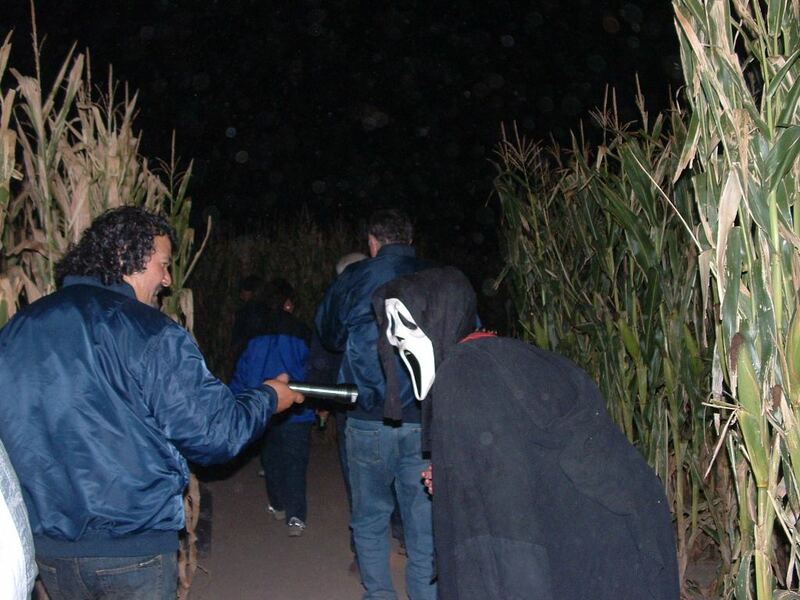 When all finally made their way out of the Maze and back to the cars, a course had been laid out for us to have some fun with. A time trial event was first up, cars making their way through a few cones up to a steady-as-you-go section, if you were gentle on the throttle then you were able to set the light off without the horn blaring out at you (not many managing this feat), from there a bit of backing skills required and a fast running passenger to run around the car. Once the passenger had done their sprint, off they went through more cones, some making bigger dust clouds than others, then to a stop at the finish. 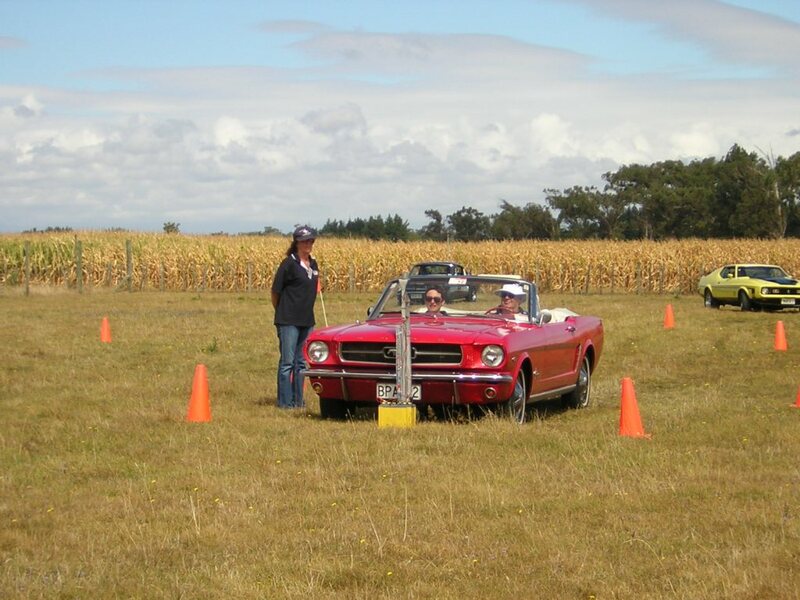 The next event of the day required good passenger direction as a blind folded driver weaved through cones up to a bucket where the passenger threw balls into the bucket. Small Pony’s were up for grabs for the winners. 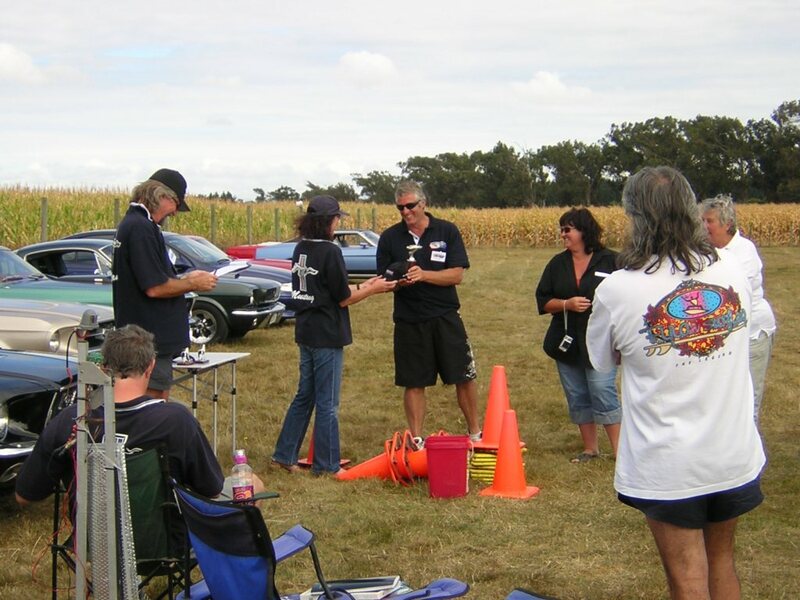 Con taking out overall time winner, Charmaine winning fastest women and Phill and Rhonda winning fastest couple. The day ended with an invite from Andy to come and take a closer look at all of the masks and costumes that had scared/thrilled us the night before. Another well organized run. 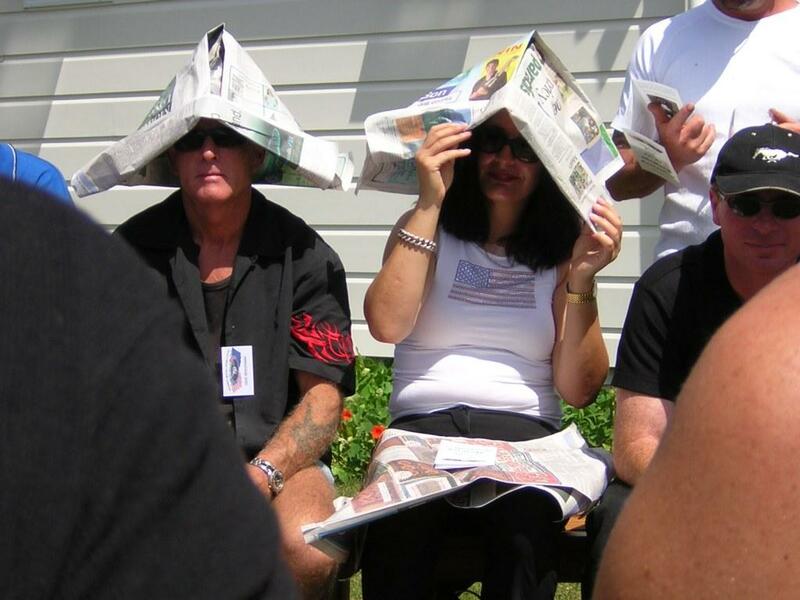 The day was a scorcher and a few were happy for any kind of shade, a couple making the most out of the daily news. About 37 mustangs plus the usual extras parked up on the grass area outside the Ashhurst Domain Café, where we had a spot of lunch and enjoyed the sun. 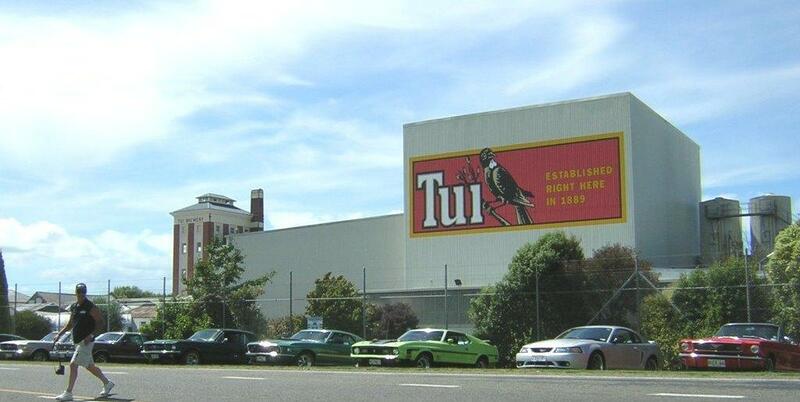 We then made our way to Mangatainoka and the Tui Brewery for a cold one (only one of course as we don’t drink and drive) and a look around. 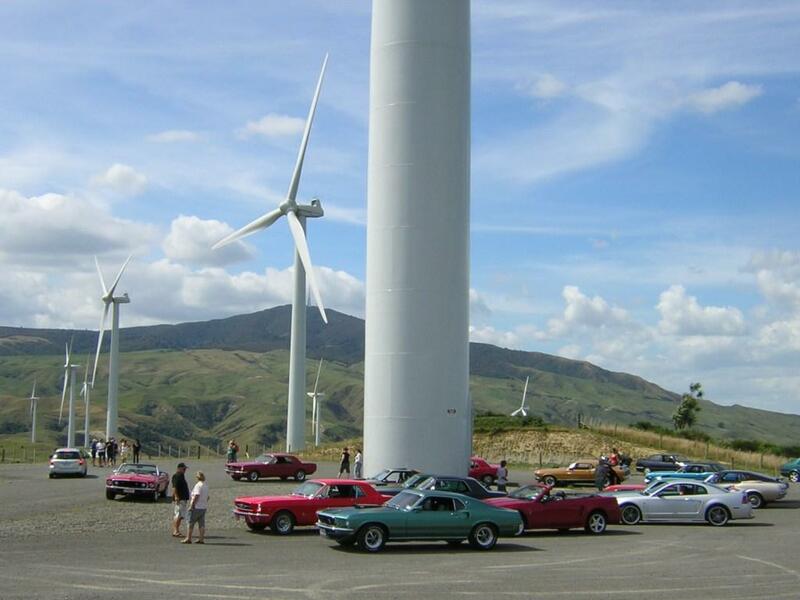 Then off we went up the hill to the Wind Turbines for a photo op and view the horizons. Our last stop of the day was the Waterford Pub in Pohangina and the opportunity to cool down in their lovely gardens and of course perhaps one more cold one for those not driving. A slightly wet start to the day but the weather god eventually smiled on us making another memorable day out for us all. 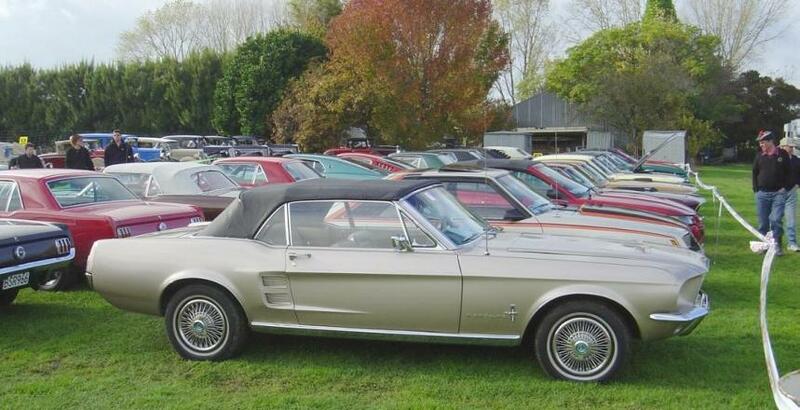 About 26 of us got out amongst it parked up with the various other clubs and American owners alike at Trentham Racecourse. 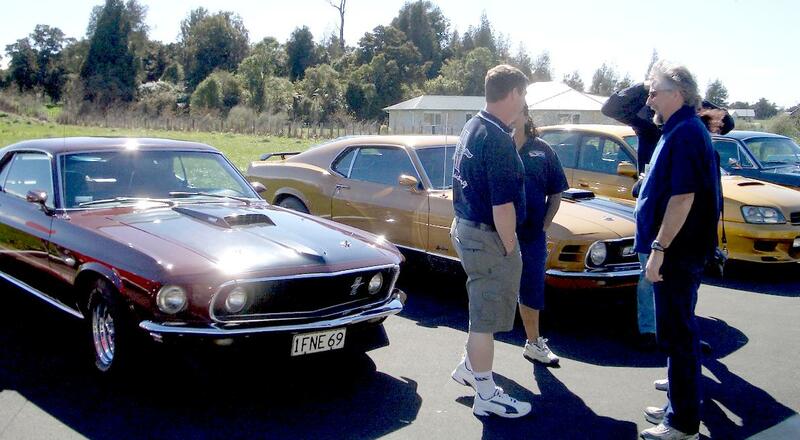 The day was spent viewing fine vehicles, listening to live music and of course watching the lawn mower races. 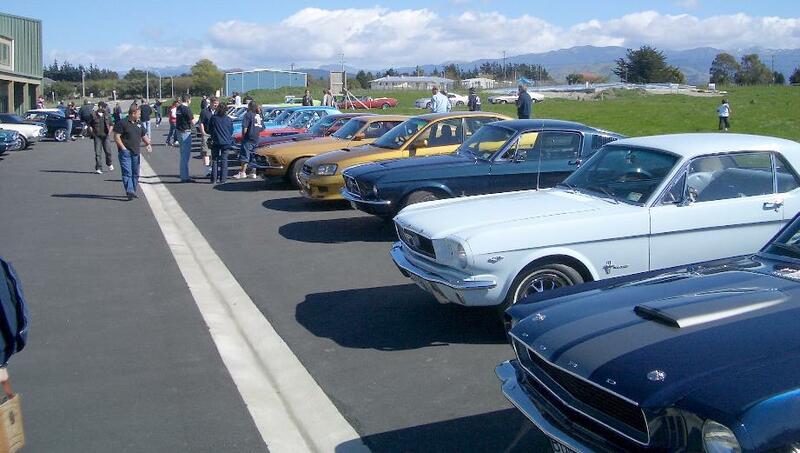 This was not an official club meeting but the overall turnout from the club, and other Ford owners was was excellent, as you can see from this panorama.. the biggest Southwards Ford day ever. The weather conditions were beautiful, and the crowd enjoyed the diverse display, including Falcons, Anglia's, Escorts, Capris, Zodiacs, etc etc I counted over 25 mustangs perhaps 2/3rds of which were MMOC club cars. 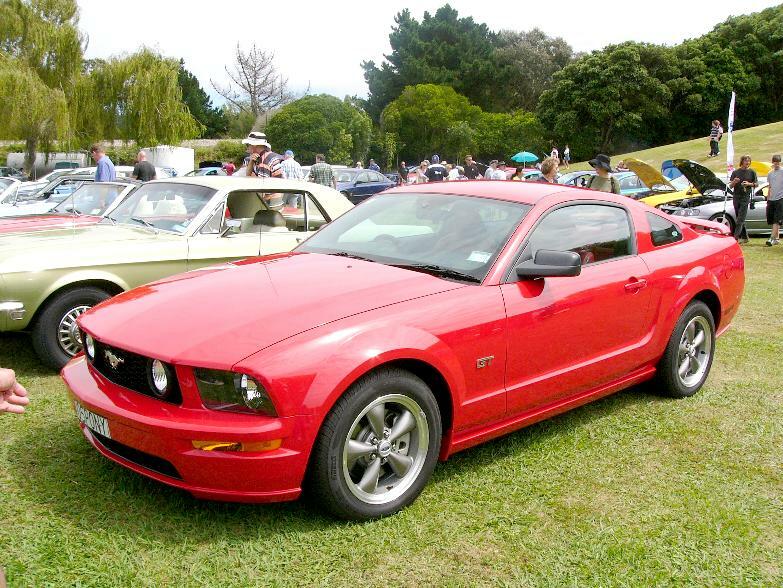 There was even one 2005 model Mustang.